You’re looking for a watch, but one that doesn’t balk at getting a little bit wet. You’ve come to the right place! Our waterproof watch buying guide was designed to help you choose the best watch for you, no matter how active you are. Even if you are only looking for an everyday watch, we’ve got you covered! First, let’s take a look at some things you should know before you start shopping for a waterproof watch. 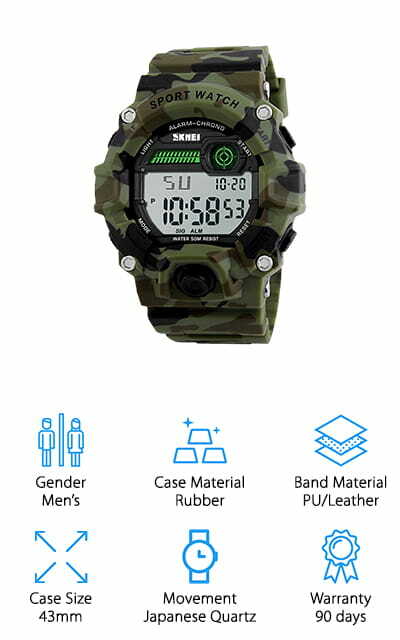 Gender: Some watches are specifically marketed for either women or men, so we’ve helped you out there. Some are made for both or can be worn for both men and women, which is a pretty neat feature. Case Material: This is what the area surrounding the face is made of. You want something durable, but also something that contributes to the watch being waterproof. This ranges anywhere from PC plastic to rubber and stainless steel. Band Material: What is the band made of? You are going to want something that is durable, but also something that will be comfortable to wear, especially if you are going to be wearing it as an everyday watch. Case Size: How big is the face of the watch? You’re going to want to be able to see the time. Isn’t that the whole point? Bigger faces allow at-a-glance timekeeping, but too big and it’s in your way. Movement: Most watches use quartz to track movement if they are analog watches with hands. Quartz is extremely accurate and well-made, and the best quality quartz movement comes from Japan. This doesn’t really apply to digital-only watches. Warranty: It’s important that your watch works, no matter what type of watch it is. If it doesn’t, the warranty period exists to help you get a return or refund so you don’t miss out on a great product. Now that you know what to look for, we can show you our selection of watches! We researched and reviewed a selection of pieces to bring you our waterproof watch reviews. We wanted to recommend only the very best to you! Our top pick is the best of our list, and our budget pick is the best on a budget. The rest of our list is full of amazing timepieces. There’s plenty of time to see them! One of the top waterproof watches on the market right now is the LETSCOM Fitness Tracker. It includes a real-time heart rate and sleep monitoring system, which analyzes and saves data about the quality of your sleep. That’s some pretty awesome technology! It will record all-day activities, such as the number of calories that you’ve burned, the number of minutes that you’ve been active, and the number of steps you’ve taken. It even comes preloaded with an amazing 14 exercise modes! Connect your phone to show distance and pace data through GPS. 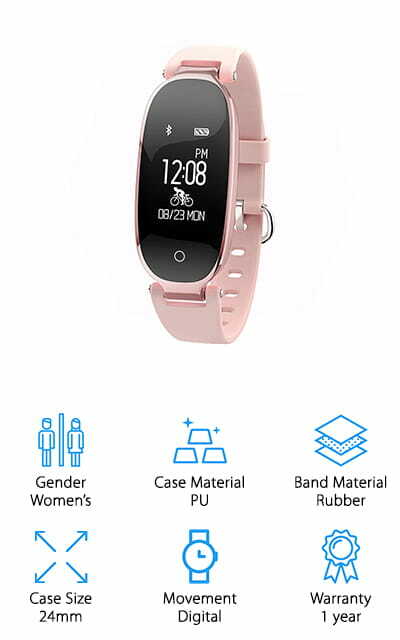 Another cool feature that this watch has calls and message display from your cell phone, right on your wrist when you need it. You can charge it via USB, and one charge will give you an amazing 7 days of battery life! We also love that it comes in black, blue, green, purple, and red, so you can choose your favorite color! The SKMEI Digital Sports Watch is the king of cheap waterproof watches. It’s a military-style watch with a large dial that you can see just about anywhere, including in the dark. It lights up, so you won’t ever have to use a flashlight to tell the time in the dark again! It’s a shock-resistant watch with a built-in stopwatch, as well as the option to switch it to 24-hour military time instead of a 12-hour clock. It’s perfect for all of your outdoor activities! There is an alarm you can set, as well as the date. The watch is sturdy, from the case down to the band. And it’s perfectly fine to take swimming or to leave on in the shower, with a water-resistant depth of 164 feet. The large dial makes it perfectly visible. We love how simple, yet effective, this design is. It shines among waterproof watches for men! The CakCity Boys Sports Watch is on our list because it is one of the greatest waterproof watches for kids that we found. It’s a great gift for boys between 10 and 15 years old because the watch band will fit them perfectly at this age. It comes with a light so you can see the time no matter how dark it is outside. It’s also shockproof and, of course, waterproof up to 164 feet, so you can take it swimming or into the shower with you and it won’t stop working. It’s got a nice big dial that is easy to see. It’s great to use as an everyday watch, as well as a sports watch! There’s a calendar built in, so you’ll always know the day and an alarm clock that you can set to beep when the time is right. We especially loved the camouflage design, one we’re sure that your teenagers will love! 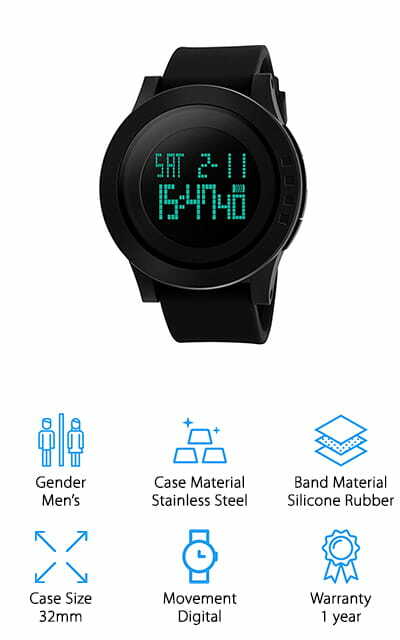 Among the cheap waterproof watches for men that we looked at, the SMAEL Digital Watch really stood out. It’s packed with functions that make it fun to wear, easy to operate, and useful for a variety of applications. The dual dial function supports the display of two different time zones at once, which is a pretty awesome feature. It’s got a built-in stopwatch and LED backlight so you can see the time anywhere. You can also change from 12-hour time to 24-hour time effortlessly. We love that it’s shock resistant, so you can work with it on and don’t have to worry about damaging it. There are an amazing 16 different color options and combinations, so you can definitely choose the one that you like the best. The band is made of rubber, and it’s super comfortable! The amazingly large 50mm case size will allow you to see the time no matter what you’re doing. First off, we just have to say that this watch is amazingly designed. 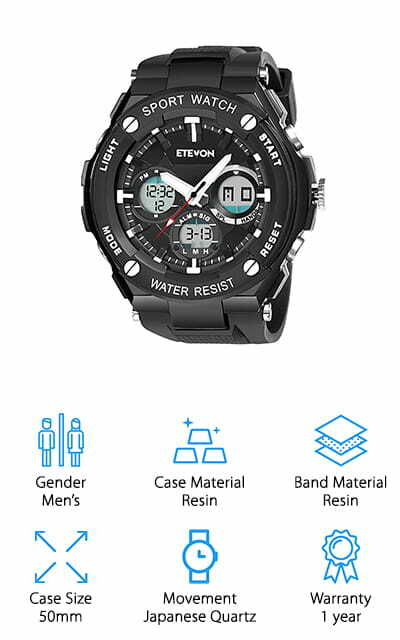 Etevon provides one of the best waterproof watches for men in this piece, which is dubbed the ‘Captain’ design. True to its name, the face of the watch has a blue and white background, which is very nautical, with a grey bezel. The really interesting thing about the watch, however, is the anchor-shaped hands. We haven’t seen that on any of the other watches we looked at! You can change between a 12-hour and 24-hour format, and there are three different dial displays embedded in the face that can be set separately. There’s an alarm that comes complete with a snooze button, as well as a calendar, hourly chime, and a backlight that will really make this watch look great. The movement is quartz and highly accurate, so you can always be on time! It’s got anti-frost capabilities as well as 98-foot water resistance! 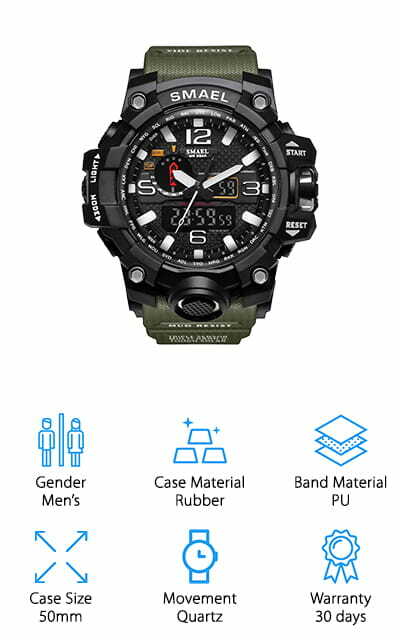 In the land of affordable waterproof watches, the Aposon Sports Wrist Watch is near the top of the food chain. It’s got a large 32mm case so you can see it at a glance. It’s shock resistant, and it will show you the time in two different time zones. We love any watch that will do that, honestly. It’s got a built-in stopwatch function as well as an hourly chime, an automatically-adjusting calendar, and a backlight that will make it super easy to see in the dark. You can change between a 12-hour clock and a 24-hour clock with ease. This casual watch is great for everyday use, both indoors and outdoors. You can take it camping, climbing, fishing, and hiking with you, so you always know what time it is! It’s water resistant to 164 feet so you can take it swimming with you with no worries at all. We love the simple design! This Kingkok Fitness Tracker is the first women’s watch on our list. It comes in three color options, including black, pink, and the incredibly beautiful rose gold color. It has a step counter, calories burned tracker, as well as GPS. It will store up to 7 days of data that you can sync to the internet using the app that they provide. You can switch the modes to allow it to track whatever you’re doing, including jumping jacks, rope skipping, and bicycling. It’s super easy to switch between these modes. 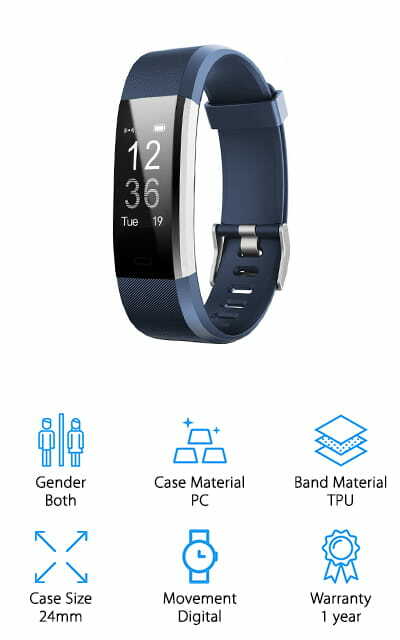 It has a dynamic heart rate monitor, a sedentary alert to remind you to move, and an automatic sleep monitoring function. Connect it to your phone in order to receive calls, text messages, and even social media notifications right on your wrist. The number of features in this watch is pretty incredible! Even with all of this, the battery remains charged for seven days! We love this watch! The MSVEW Digital watch has a second display, a button-activated LED light, as well as a stopwatch and an alarm clock function. There is so much that this watch does! The ABS case makes sure that the watch is resistant to shocking, so it will continue to function even if you drop it. You can easily switch to a 24-hour military time display if that’s what you’d rather see. You can use it for working in the yard, swimming, diving and even showering with a waterproof resistance of 164 feet. The movement happens to be Japanese Quartz, so it is super high-quality and accurate. This is one of the first waterproof watches for women on our list, and it doesn’t disappoint as far as having the features that you want! The ABS case with the stainless steel back makes sure that you won’t’ lose the watch entirely if you happen to drop it or bang it into something. This Gosasa Women’s Sport Watch is a sleek, beautifully designed watch for women. 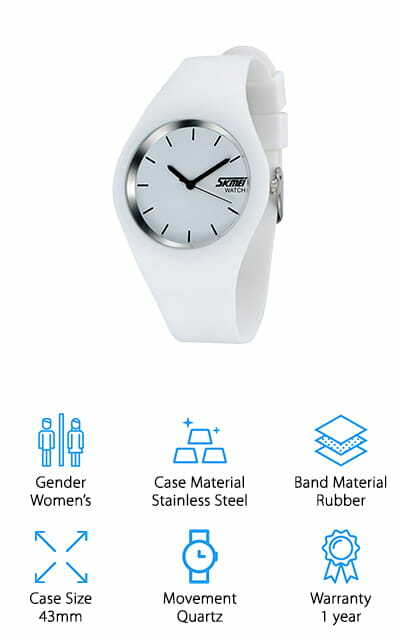 It’s all in white, with a stainless steel case nestled in a rubber band. If you’ve been looking at simple ladies waterproof watches, this is the one for you! It tells analog time with no digital components, so there’s nothing to fiddle with; just set the watch and you’re good to go! The rubber band protects the face so it’s shock resistant for sports or outdoor activities. It’s also great as an everyday watch, and since it is white it will match nearly any outfit! For people who enjoy simple watches and an elegant, minimalist design, this is the perfect watch. And of course, it’s waterproof! Take it swimming with you, and don’t be afraid to wear it in the shower or when washing your hands. This little watch is tough! The face is crystal clear, so you always know the time! AIKURIO has one of the best women's waterproof watches right here in the Quartz Watch. 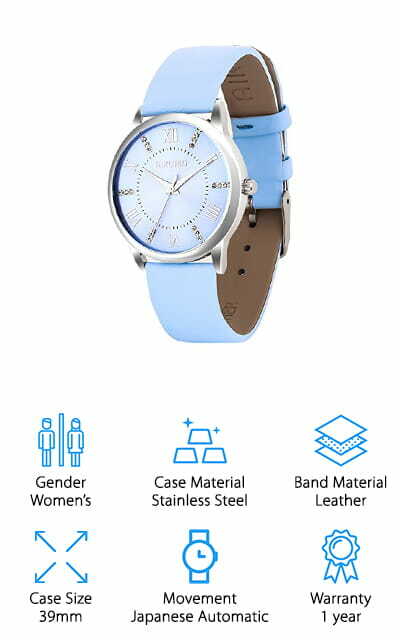 The leather band is soft, comfortable to wear, and comes in light blue, pink, or white. The dial or case is 39mm, so it’s nice and big, and it needs to be – so that you can see the crystal accents embedded in the watch face! Every other hour marker is made of crystals, and the effect is gorgeous. It doesn’t get much prettier than this! It’s waterproof to 98 feet, so you should be fine washing your hands with this watch on. It’s great for a night out or as an elegant everyday watch! We love that the dial is square so that it blends into the band, and the face of the watch is circular. It adds another dimension of style to this already-stylish watch. The movement is clear and precise Japanese quartz, so it fulfills its most important function: keeping time!